Almost every region in Canada has been positively impacted by the economic activity created by oil sands development. In total, oil sands development is expected to contribute more than $4 trillion to the Canadian economy over the next 20 years. Further, through a combination of provincial and federal taxes and provincial royalties, the oil sands industry is expected to pay an estimated $1.5 trillion over the next 20 years. This economic contribution can go a long way towards funding the programs Canadians value such as healthcare, education, and public infrastructure. Oil sands development creates a significant number of jobs within and outside of Alberta. Capital investment in our energy sector generates development activity, which in turn spurs job creation and economic growth across Canada. In 2017, the oil sands supported and created 533,000 direct and indirect jobs across Canada (CAPP, Economic Report, 2018). 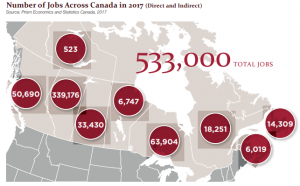 Many of these jobs are in provinces outside of Alberta – the goods, materials and services used to construct and operate oil sands projects, mines and upgraders come from across North America. Many of the components — tires, trucks, gauges, valves, pumps, etc. — are produced in Ontario and Quebec. However, as the oil sands industry evolves from an intense construction phase to focus more on operations the workforce requirements are changing. And industry requires an increasingly skilled workforce. A strong oil sands sector drives a strong national economy by attracting capital, creating jobs and supporting public services. Canada’s oil sands create prosperity across the entire country – not just in Alberta. Local companies in every province supply goods and services to the oil sands—creating jobs, growth and economic opportunity in local communities. CAPP has been conducting a bi-annual survey of oil sands and service companies across Canada since 2012 to determine the value of the oil sands supply chain. The data is not a complete and exhaustive list of suppliers in a particular region, but serves to highlight existing examples of the commerce and trade relationships between oil sands producers and companies across Canada. In 2016-2017, oil sands operators cumulatively spent $5.5 billion on procurement with businesses in the RMWB and $8.4 million on procurement with businesses in Lac La Biche. The oil and natural gas industry is Canada’s largest private sector investor, with oil sands alone injecting almost $13 billion into the economy in 2017. 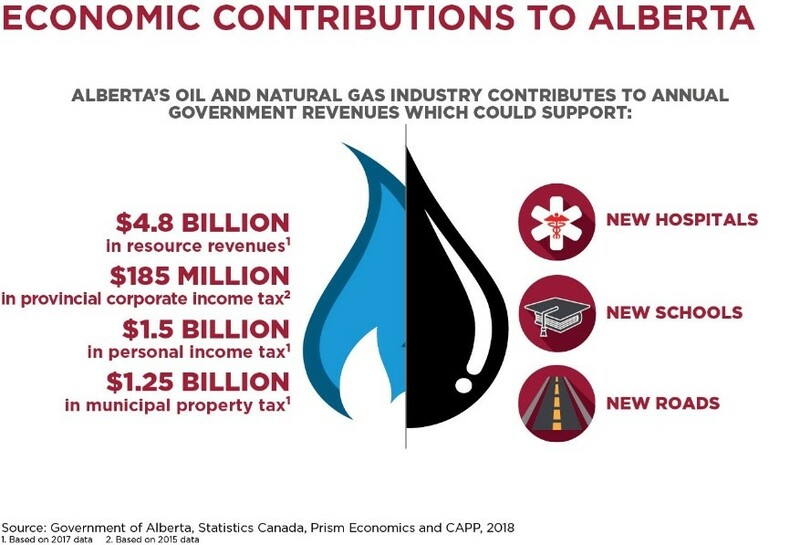 The oil sands industry and its suppliers contribute to government revenues through corporate taxes, personal income taxes, property taxes, royalties, land sales and other costs. Over the next 20 years, the oil sands industry is expected to pay $1.7 trillion in provincial and federal taxes – including royalties. These revenues contribute to government spending on infrastructure, social services and other important programs. A healthy oil sands industry results in higher revenues for governments. 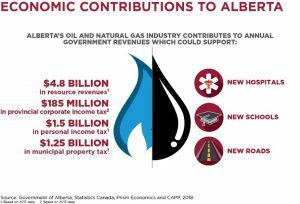 The tax contribution of the oil sands industry to the communities in the Athabasca oil sands region have contributed significantly to funding ongoing improvements. In 2017 the operating and capital budget for the Regional Municipality of Wood Buffalo was $804 million. 87 per cent, or about $700 million was contributed by the rural non-residential rate payers comprised mostly of oil sands companies and service industries.